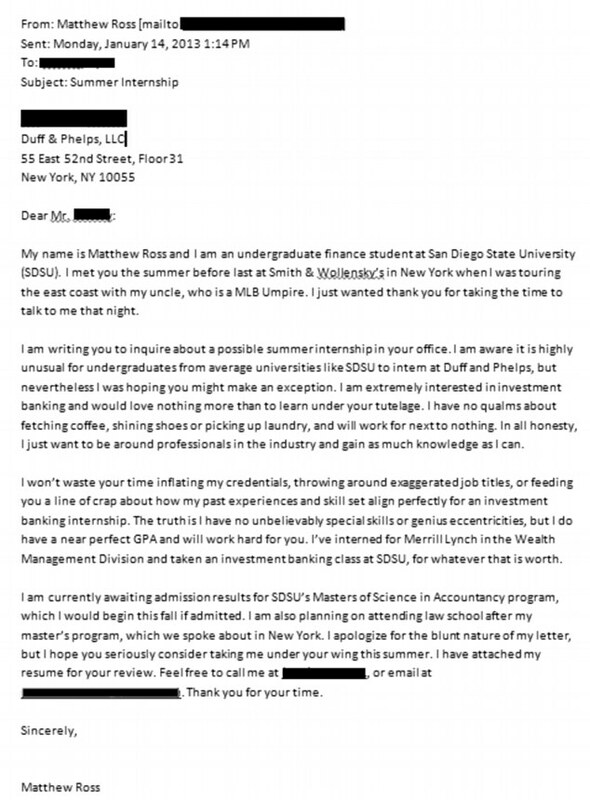 Matt Ross parlayed a humorous cover letter into an internship and full-time job at Duff & Phelps in Los Angeles. For fresh-faced college graduates looking to land that first job, standing out from the crowd is never easy. In January 2013 he penned a now famous email cover letter to a managing director at Wall Street firm Duff and Phelps asking for an internship. In it, he said he "won't waste your time inflating my credentials, throwing around exaggerated job titles, or feeding you a line of crap about how my past experiences and skill set align perfectly for an investment banking internship." Ross also claimed to "have no qualms about fetching coffee, shining shoes, or picking up laundry." A big gamble: When he sat down to write the cover letter, Ross yearned for an edge. He was about to graduate from San Diego State University. It's a good school but it lacked the prestige of some others in California, such as Cal-Berkeley, Stanford, UCLA and USC. "I was reading through some cover letters, and they were all fluff to me, everyone was embellishing and lying," Ross said. "I wanted to take a fresh approach, tell the truth, and be brutally honest." It worked. The Duff & Phelps managing director he emailed promptly got him an interview in the firm's L.A. office. "I was shocked. When I clicked send, I thought there was a 50% chance he'd respond," Ross said. Foot in the door: With a 3.9 grade point average in accounting, Ross was obviously a strong candidate. But his resume was not too different from the hundreds of others that Duff & Phelps receives for internship opportunities, according to Sherry Cefali, who heads up the firm's L.A. office. When Ross came in to interview, Cefali and the other hiring managers were extremely impressed. He was articulate and had good answers to the firm's tedious technical questions. 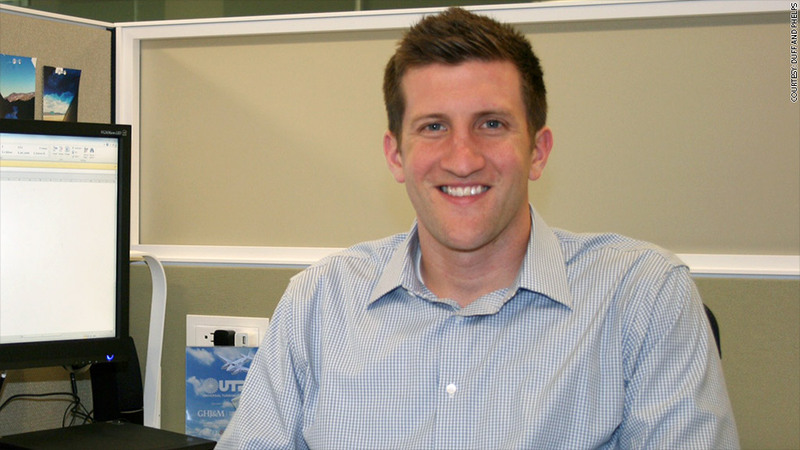 "The cover letter opened the door but he really did get the job on his own," Cefali said. "I was just pretty much thrown in," Ross said. "I tried to be disciplined, to work hard, to do what's asked of me without raising any questions or raising any flags." "Matt's always the guy that's going to raise his hand," said Jordan Lampos, a Duff & Phelps vice president. "You know the work level is going to be good and there's going to be a high level of accountability. " Advice for others: Lampos thinks that the fact that Ross didn't come from an elite university may have helped motivate him to succeed. He said new employees who graduate from top colleges often have investment banks fawning over them, which can sometimes lead to a sense of entitlement. "They don't take it as seriously or they're not as grateful for it," he believes. As for Ross, he tells investment banking hopefuls to stay resilient in their job search. Though he admits he "probably got lucky that the cover letter exploded the way he did," he's doing what he can to help others get noticed. "Hopefully they'll get an interview or foot in door," he said. "It's up to them at that point."